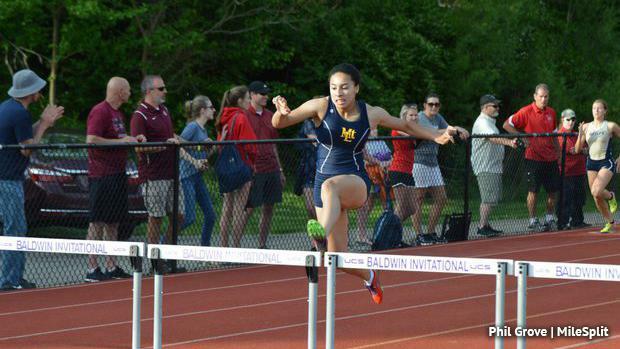 Molly Mangan leads the way of girls' 300-meter hurdle returners this season. The Mount Lebanon senior is the lone returner in PA with a time from last year under 43 seconds. Mangan went 42.86 to take second to Upper Dublin's Madison Langley-Walker at Ship. Mangan was sixth as a sophomore in the event. She'll be the one to beat in AAA this year, but there's a talented group of returners that will challenge her. Cumberland Valley's Taylor Jede was fourth in the state final last year. She closed out her season well, running 44.00 to win the D3 title and then 44.17 at states. She'll be in the mix for a high finish again this season. The Coatesville duo of Arianna Eberly and Porsha Miles are the only others with sub-44 second times from a year ago besides Mangan. Eberly ended up fifth at states in AAA, while Miles just missed out on the final placing ninth overall. Both will be looking to make moves up the rankings this spring. Three other returning state medalists in AAA hail from District 1. North Penn's Anais Williams was sixth last year in the state final, followed by the Cheltenham duo of Brianna Smith (seventh) and Bria Barnes (eighth). All three should mix it up near the front again this season. Barnes had a big indoor season in the 400 on the track, so it will be interesting to see if she pursues the intermediate hurdles again this spring. Exeter Township's Isabella Karstien and Warwick's Cassidy Kline will also be looking for spots on the podium this season in the event. AA will be intriguing as well his season. Mia Kilroy of Trinity popped a nice PR of 44.77 in the state final to grab third. She's the top returner based on states place. But Swenson's Jada Smith has the fastest returning time in the classification. She went 44.36 in the prelims at states, before placing seventh in the final. Western Wayne's Trina Barcarola (fourth), Deer Lakes' Kiera Cutright (sixth), and Milton Area's Leah Bergey (eighth) are also among the returning AA medalists back this season. Athens Area's Rachel Hutchinson went 44.75 last year, but didn't make the final. She'll be a factor this spring for sure. Watch an interview with Mangan at WPIALs last year and check out the top 1000 returners in the girls 300-meter hurdles below.